Nothing like a colonel as a guardian angel. Clint Eastwood reprises his role as The Man with No Name in this follow-up to A Fistful of Dollars. This time, he’s on the hunt of the ruthless killer El Indio (Gian Maria Volonte). It seems that our man has finally taken on a task that is bigger than he can handle, so he must team up with soldier-turned-bounty hunter (and a brutally efficient one at that) Douglas Mortimer (Lee Van Cleef). Spaghetti western A Fistful of Dollars was one of the sleeper hits of 1964. Sergio Leone made enough of a profit (even after losing a lawsuit to Kurosawa Akira) that he followed up with For a Few Dollars More, only this time he was careful to write an original story. Despite Clint Eastwood’s character (Monco as he was known here) being allegedly the main character of For a Few Dollars More, the movie seemed a lot more interested in developing El Indio and Col. Mortimer, both of which contributed to making For a Few Dollars More a darker story than its predecessor. A Fistful of Dollars had a pretty high body count to begin with, but there generally was more death in For a Few Dollars More, including a woman and her child. In addition, For a Few Dollars More had a (slightly) higher budget to work with, so some deaths were more graphic than anything that ever happened in A Fistful. Well, nobody ever said the Wild West was a clean place. That said, I do have a minor beef with the plot in general. Overall, I thought the narrative that surrounded Indio and Mortimer was a very good idea, but it seemed like this story took a backseat to allow shootouts to take center stage. Furthermore, it felt like Monco was acting more as a casual observer to the plot unfolding than as a central character, thus making it seem that (ironically enough) Eastwood was probably the least essential part of For a Few Dollars More. It didn’t help that I felt his relationship with Mortimer was handled a little clumsily. Still, I would say For a Few Dollars More is worth watching just to see Sergio Leone’s directorial style. 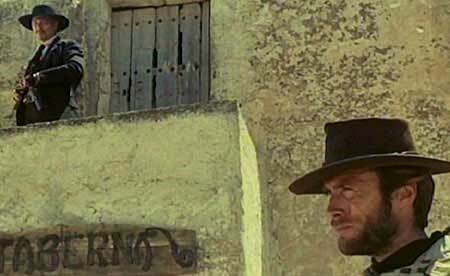 Leone once again showed how you can make a western cool in the 1960s with his stylistic choices in cinematography, and this was augmented once again by a terrific score written by Ennio Morricone. Unfortunately, once again the movie was filmed with a silent camera, with the dialogue being dubbed in post-production. For some reason, the less-than-perfect lip-synching seemed a little more distracting than it did in A Fistful of Dollars. While I have yet to see The Good, The Bad, and The Ugly (1966), I can already see why For a Few Dollars More was considered by many to be the weakest film in the Dollars Trilogy, and for that reason I say I enjoyed A Fistful of Dollars more.